Driving from the west on Interstate 80 – take Exit #13, “Downtown Reno” and turn right (south) on Virginia Street. Proceed past Harrah’s Casino. We are directly across from Reno City Hall (between Second and First streets) right in the heart of Reno. maps to the Arch of Reno Wedding Chapel! • Click here for a map to our location. • Click here for a map to public parking. 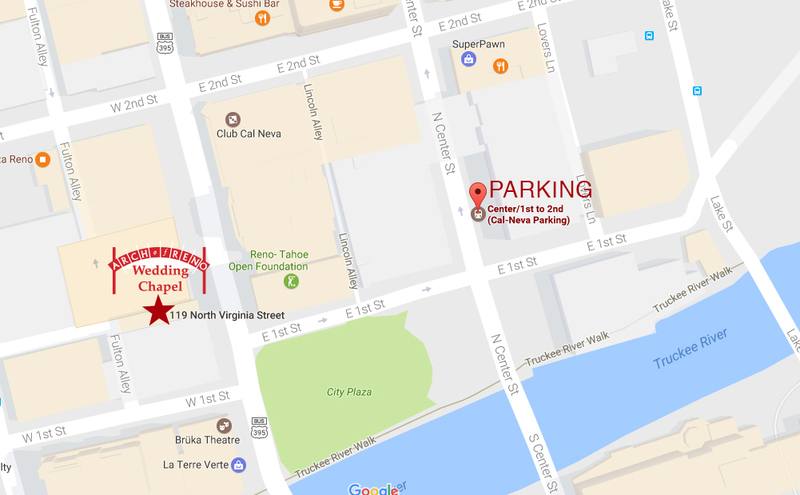 Parking is available by turning left (east) on First Street and then left (north) on Center Street to access the entrance to the Cal-Neva garage (east side of Center Street). Most of the time the Cal Neva’s parking garage is free. The city garage (west side of Center Street) is available for $1 per hour. Metered spots are available on Second Street (west of Virginia), on Sierra Street and on Mill Street (between Virginia and Center next to the Pioneer Center). Validated parking is also available for the Parking Galleria located on First Street just west of Sierra Street. We will validate for the bride and groom’s vehicle only (maximum 2 hours). I want to thank you guys for the most memorable wedding ceremony we could have hoped for. Victor was so personable — we couldn’t be happier. The process from the booking to the “I do” was smooth and sincere. We can’t recommend them highly enough! The Schilling wedding was beautiful! Thank you so much, Arch of Reno Wedding Chapel!! Very nice!